Birds Of A Feather: The Big Reveal! 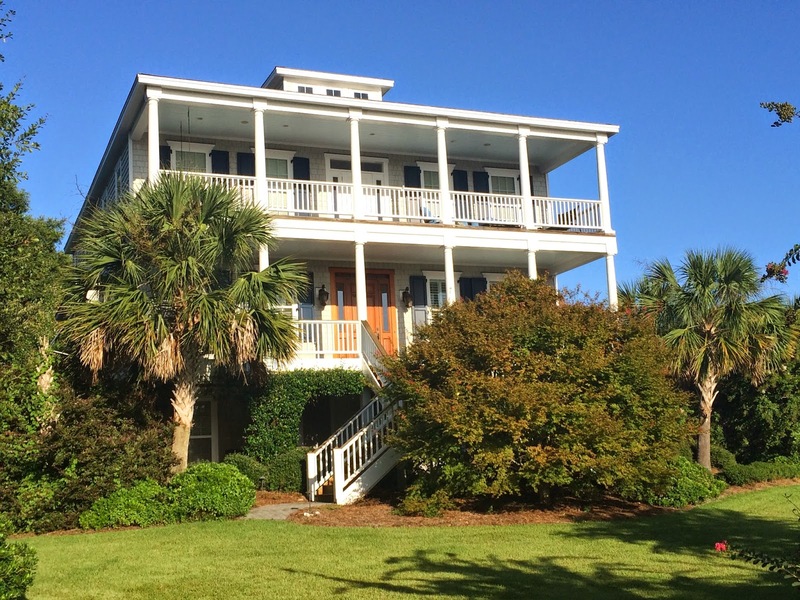 One month ago, a client referred me to a family that had bought a new house and wanted to move in before school started. 1. Showcase their art collection (which is amazing by the way). 4. Oh yeah, and having lived in the same house for 25 years prior to buying this one... they needed almost ALL new furniture. 3. Panicked again. A job this size would normally take me at least 6 months. 4. Got texts of their main art pieces. 5. Started working on design boards. Lots of them - one for each room. 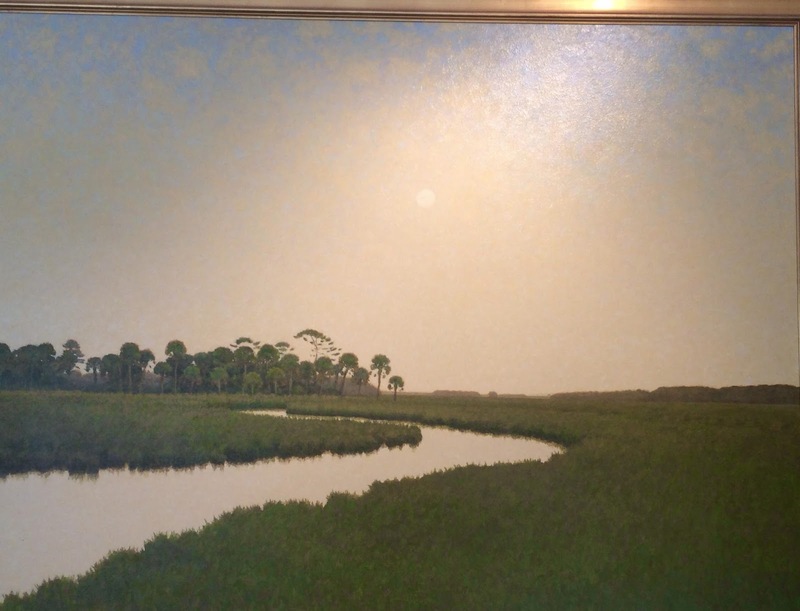 These photos don't depict how amazing this art collection is. I used these two John Carroll Doyle pieces in the main space and pulled out the grays, chocolates, coral and greens. Custom pillows complete the sofa and tie in the colors from the artwork. 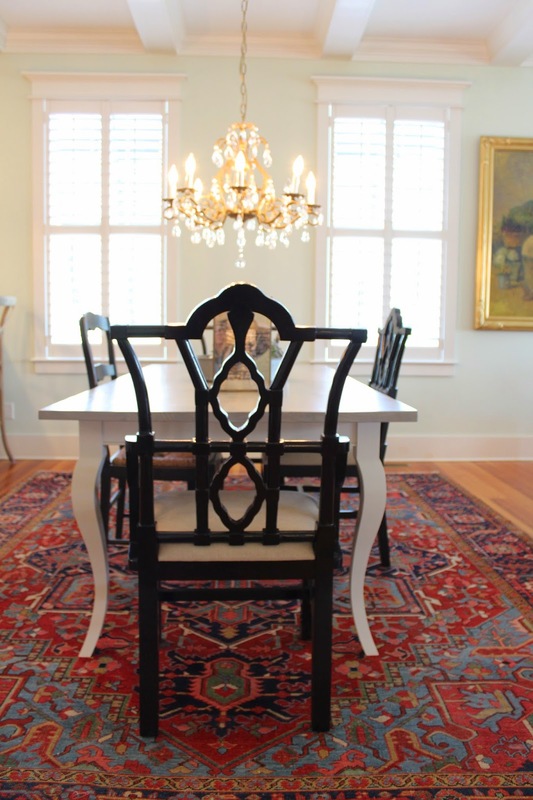 I placed a worn, beautiful Oriental from their old home on top of a large jute rug. Here's a tip: Their Oriental rug was too small for the space, but the 10X14 jute adds texture and makes the room feel much larger. The layered rug on top gives color and softness. Notice the large back to the gray velvet sofa? The clients had a beautiful buffet in their old home. With all of the walls being used for art/windows, there was no where for a server. I convinced the owners to let me (Soundside Carpentry) cut the piece down so that it could function as a buffet and a console. We also needed a large space for one of their largest pieces of art. 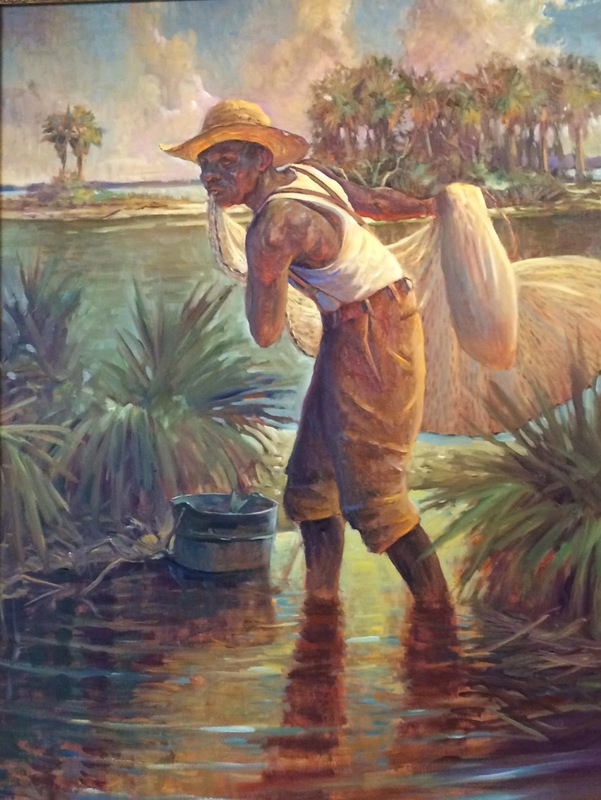 This oil by a Charleston artist is 66"x 54". It is huge and needed it's own space. This paneled wall was perfect. I'm planning on adding gallery lighting just as soon as possible so it will be properly lit. A comfy traditional wingback (with a twist - leopard) adds additional seating and is a prime TV watching spot. 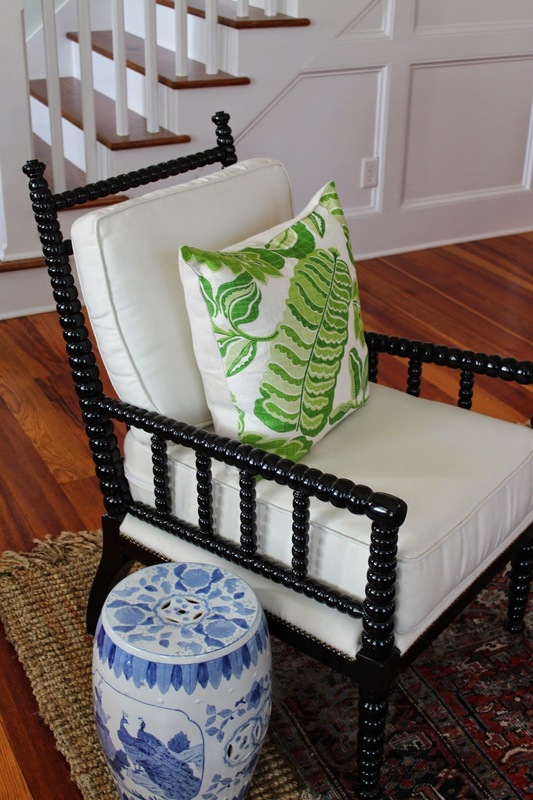 This abacus chair pulls the black from the dining room and holds a pillow I found on Etsy from the United Kingdom and the garden stool is from The Coop. I wanted leather that looked worn and was the color of cigars. These have amazing lines and nailhead detailing for an old, weathered look. 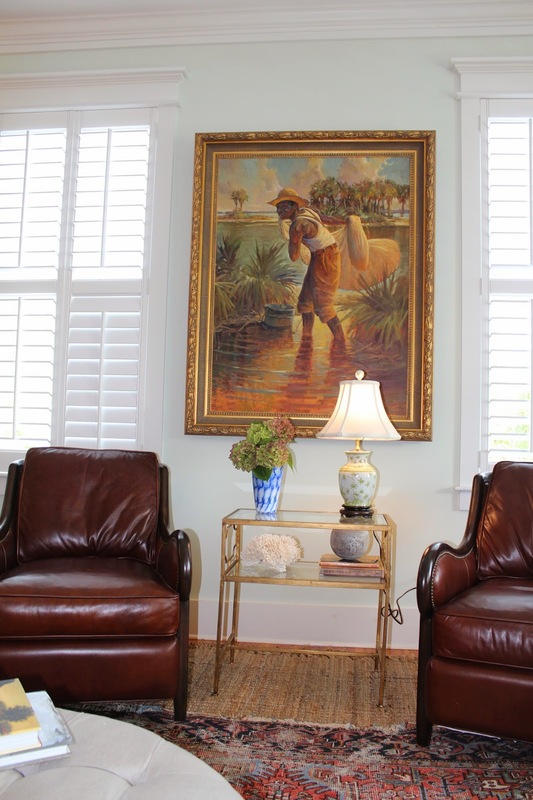 I wanted this space to not only showcase the art, but have a low country vibe with pieces that appear to be added over time. 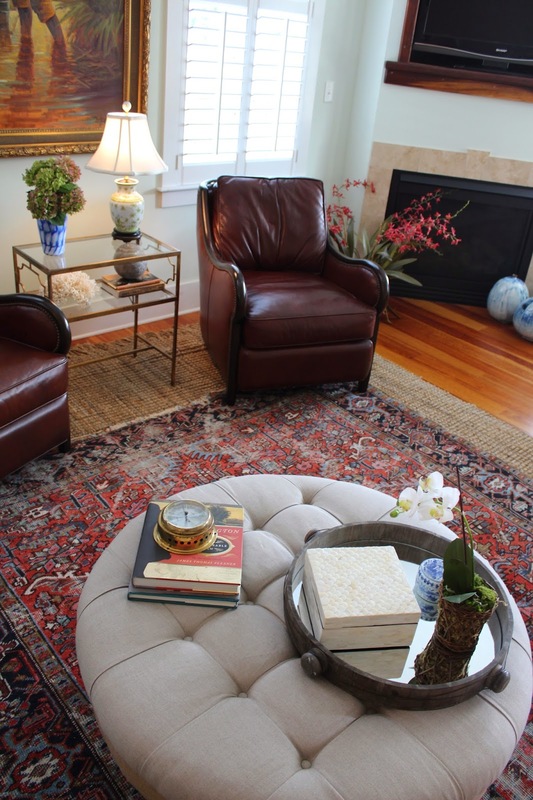 The scatter rugs came from the client's old home. I literally brought the rugs, the art and the buffet. Everything else was bought to work with those pieces. 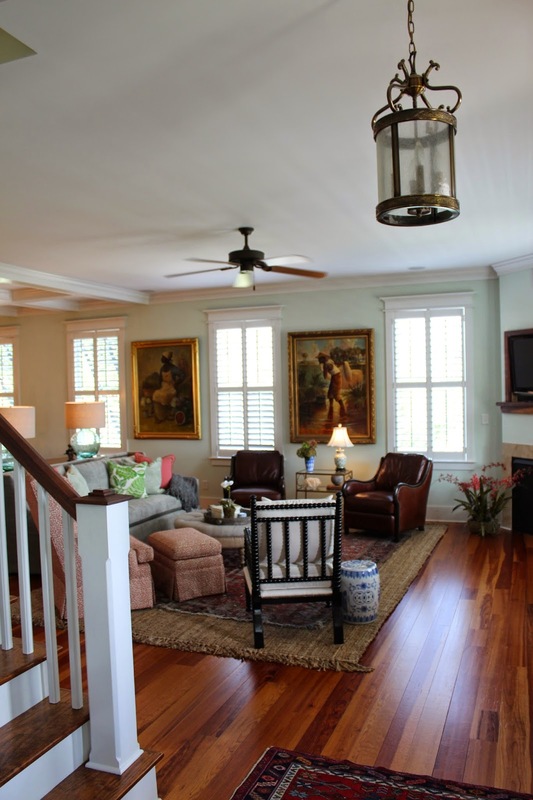 The rugs make for an easy transition from the foyer to the main living space. 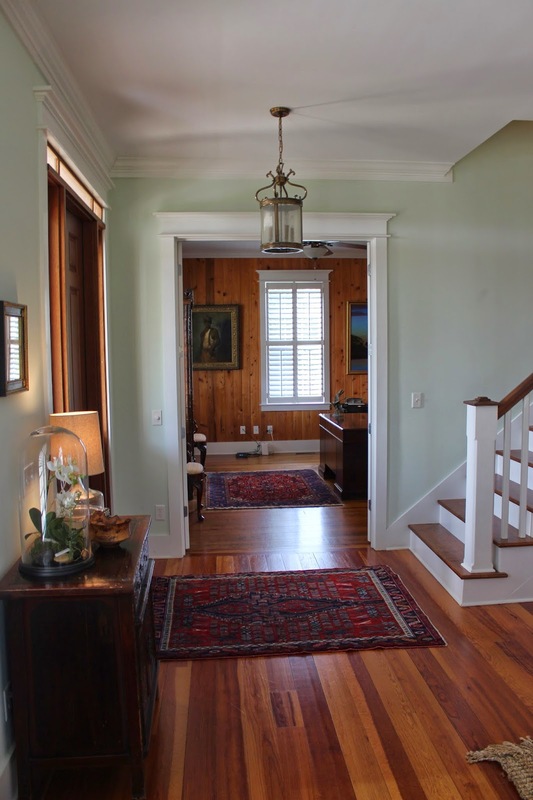 I love how the furniture floats on the gorgeous heart pine floors. I ditched the idea of a coffee table for an ottoman that could double as a table and a place for feet. It's linen with a burlap base. Soundside Carpentry made the custom table with antique wood with a gray wash and a cream lacquered base. I didn't want to compete with the floors so I chose gray. Please notice that there are 6 chairs (3 en route). All of the chairs didn't make it in time, but I will post pics when they arrive. The leg shape was chosen to mimic the lines of the Emperor black lacquered chairs. 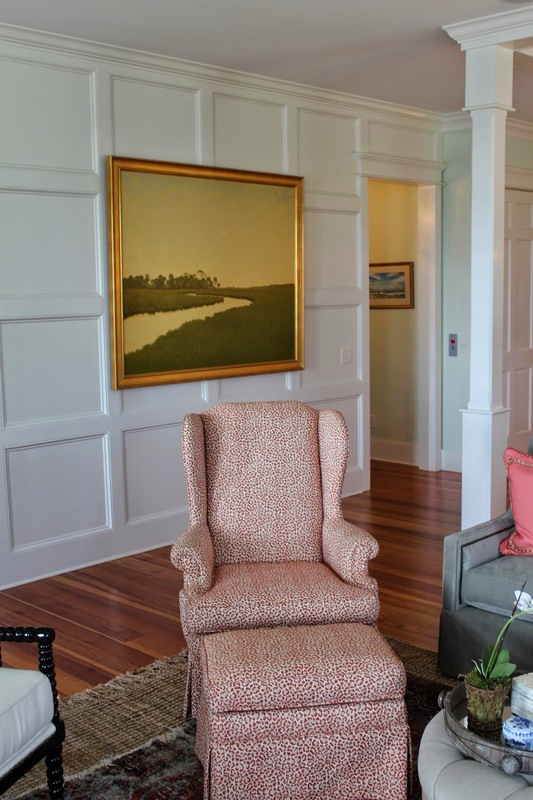 Linen seats keep the look clean and simple without competing pattern with the beautiful Oriental rug. 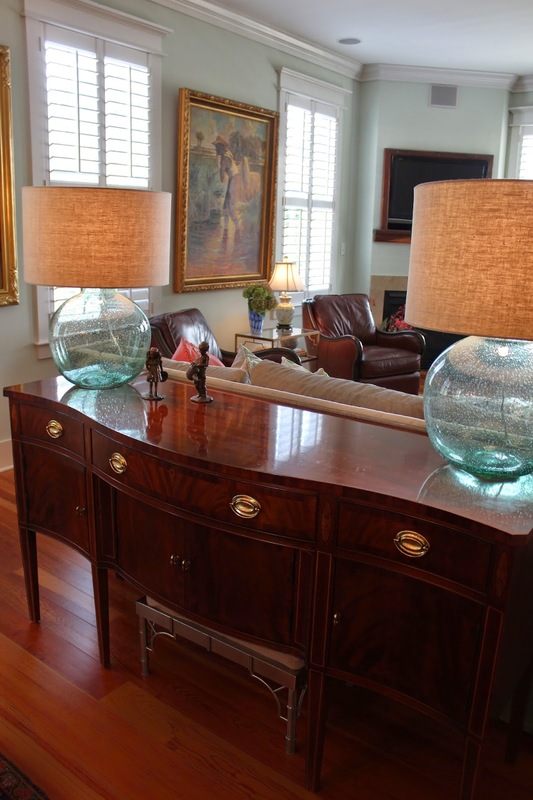 A cloche from Maran Home and a bowl from the client's collection (made from NC oak) grace the entry table and welcome the new clients into their new space.